Semtech Corporation (Nasdaq: SMTC), a leading supplier of analog and mixed-signal semiconductors, today announced that its LoRa® wireless RF solution will be featured in the second global Internet of Things (IoT) challenge presented by the LoRa Alliance™. The challenge is focused on creating a safer, smarter and more sustainable world and, in partnership with the Red Cross in Kenya, will accept solutions from four categories: food, water, health and safety. Through November 1, companies can submit LoRaWAN™ solutions from one of the four acceptable categories. Submissions should include a description of the solution, including its benefits, how it is implemented and used, as well as a prototype. Finalists will receive travel and accommodations to Mobile World Congress in Barcelona on February 27-March 2, 2017 where the winner will be announced. The LoRaWAN specification is based on Semtech’s LoRa two-way wireless solution and is standardized by the LoRa Alliance. Its purpose is to ensure interoperability of IoT solutions and networks, low power, wide area connectivity, scalability and more. Currently, the LoRa Alliance has over 300 members committed to using and standardizing the LoRaWAN specification worldwide. 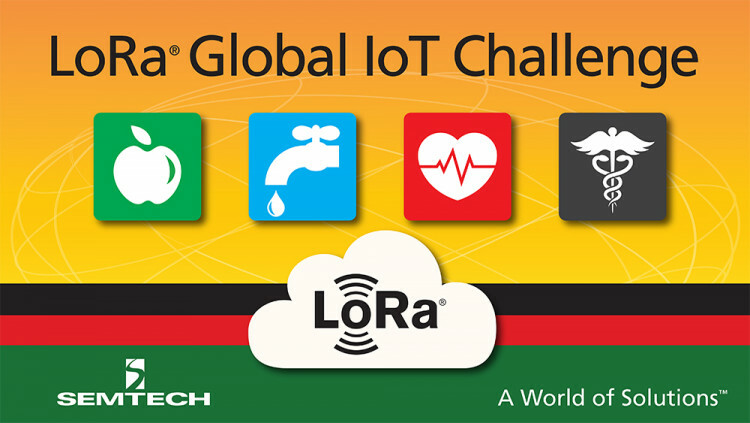 In the last LoRa Alliance Global IoT Challenge, which received submissions from over 200 companies around the world, finalists presented innovative LoRa-based solutions that included a connected home application, a shipping pallet tracker and a bed bug monitor for hotels. The LoRa Alliance is an open, non-profit association of members that believes the Internet of Things era is now. It was initiated by industry leaders with a mission to standardize Low Power Wide Area Networks (LPWAN) being deployed around the world to enable Internet of Things (IoT), machine-to-machine (M2M), and smart city, and industrial applications. To learn more about the LoRa Alliance, visit www.lora-alliance.org.